Juicing is the new “it” thing to do. I’m convinced because the word juice is everywhere I look – articles, blog posts, grocery stores, Starbucks, etc. To be honest, I am not 100% sold on the idea. IF it’s the only way you can manage to get your daily dose of fruits and veggies, then fine. Do what you have to do. However, when you eat the whole fruit (skin, fiber, etc. ), there are so many added benefits, with satiety and additional nutrients being two big ones. I won’t deny that juice tastes good…really good! If I could afford to visit Whole Foods a few times a week for their delicious juices, I would do it. And if we lived in a larger apartment with more storage, I would’ve happily taken my in-laws’ juicer off their hands when my MIL offered to give it to me. Since this was my first time making juice, I decided to go with the fruit only variety. I pretty much grabbed all the fruit we had on hand. Next time, I’m going to be a little more adventurous and incorporate carrots, ginger, and maybe some celery. The options are endless! I’ll be the first to admit that I went a little bit overboard with my fruit selection. What can I say?! I was excited! 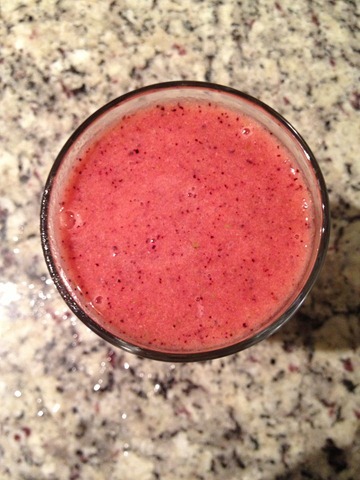 Note: While I didn’t use a juicer to make this, I did use my Blendtec, a high-power blender. The Blendtec has a digital interface with one of the options being “whole juice.” I’m honestly not sure how this would fare with more traditional blenders. However, it seems that many major brands are coming out with affordable high-performance blenders, so it may be worth a try if you own one of those. Add all ingredients to the blender, with the ice cubes being last. Blend using the “whole juice” option. Pour and enjoy! This juice was fairly thick, not too sweet/a little tart, and super filling. Vishnu suggested that next time I stick to 2-3 fruits versus 5. Honestly, I’m not sure what I would change – use half of the apple, add a banana and/or pineapple for added sweetness, add veggies…we’ll see! I can see myself having a lot of fun with this! The blender is like an open canvas – create what you will! Are you a juice lover? What’s your favorite combo? Mmm like you I prefer to eat my fruit but juices are especially refreshing when the weather warms up…and I’d definitely rather drink fresh over packaged juice! I love freshly squeezed apple juice- boring but always hits the spot. When I was drinking veggie juice daily last year, my go-to combo was beetroot, spinach, carrot and celery…such a great way to start the day, must bring it back! I may have to experiment with beets! I bet they would make for a beautiful colored juice! Hi Ronak! I took your advice and made a kale and pear juice today. Delicious! Will try that combo soon. What kind of apple do you use? I’ve been making “juices” lately too. Mine aren’t quite as juicy since I have to use liquid with my old blender, but all the healthy ingredients make me feel great! I actually prefer my “juice” to be a little thicker. It leaves me fuller longer too. I”m not really a juice person, but I’m all about smoothies. I believe the skin and all have benefits, so I’m not convinced that juicing is the way to go. If you really want to find a good balance between the 2, I think the vitamix is so powerful it’ll basically juice all the fruits for you. It’s crazy! Yep, the BlendTec is just like the Vitamix – it even has a whole juice option. Love it! Today I’m enjoying a juice made with a grapefruit, an apple, celery and a sprig of mint. I love it! 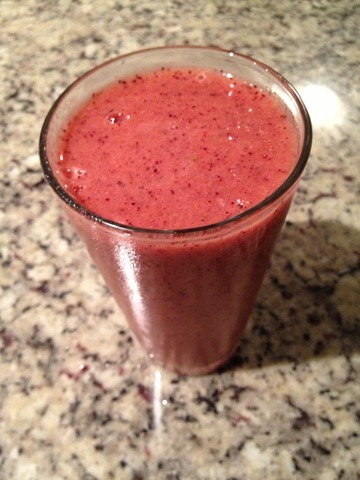 5-7 Strawberries, 1/2 Banana, (1/2 Mango or 6-7 Blackberries), and hand full of spinach with tons of ice… Try the winner’s mix! Bought a cucumber because of you this weekend! Will try adding it to my next juice.